Success! I have managed to deal with several of the headaches. 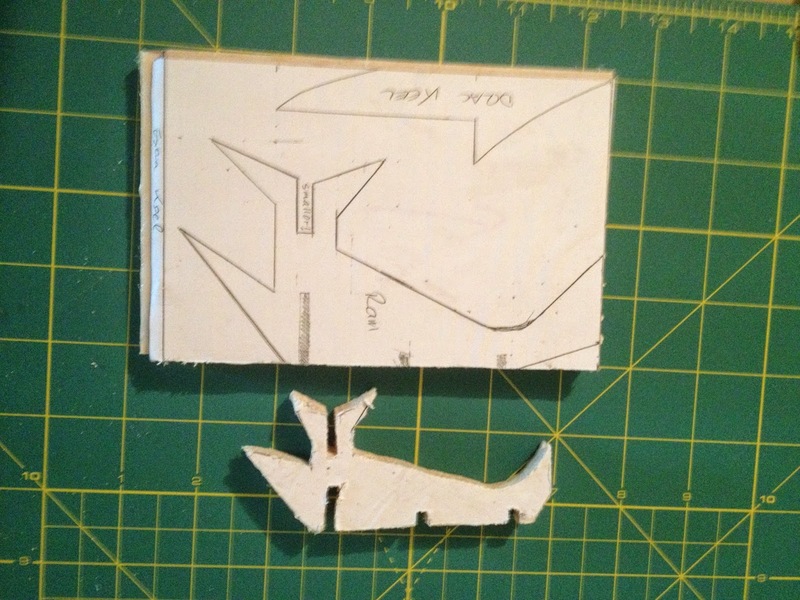 1) I think I've cracked how to make the ram and keel. First I picked up a length of 3mm balsa wood. These are 10cm/4" wide so I cut three 10cm squares and stuck them together (alternating direction of the grain) with evenly spread white glue. Once dry I had a fairly sturdy block 10cm square and about 1cm thick, which was still surprisingly light. The tricky part was then to get the shape of the ram. 10cm on a side was limiting, but rotating it through about 30° gave me about the length and shape I needed, and I drew the approximate shape of the ram onto 5mm gridded paper. Then I photocopied my scribbles and glued it to one of the faces of my block. I also stuck some blank paper onto the other face, to add some solidity to the piece. I left it all for about 24 hours to set, and cut along the guidelines with a fret saw, which almost cut through too easily. I had been dreading the sawing, but it actually went off very well. To be honest, the finished result of the 10cm x 10cm felt a little small for his vessel, so I tried a second version on 10cm x 15cm and that seemed to work better. The picture here shows both paper plans. To secure the ram to the prow I cut out three slots to fit with the existing balsa decking - you can see this in the first (smaller) ram. I also had to hack back at some of the polystyrene, but that will get filled later. The exposed edges of the balsa laminate was still quite soft in places, so I sealed the exposed surfaces with some paper and white glue. That should give a smooth and solid finish, and also camouflage some of my less impressive sawing. The rear keel was glued onto the bottom of the rear drag deck, and I have something that actually looks the part of a Hullcutter! As I mentioned, the first attempt worked well but it felt like it was bit on the small size. 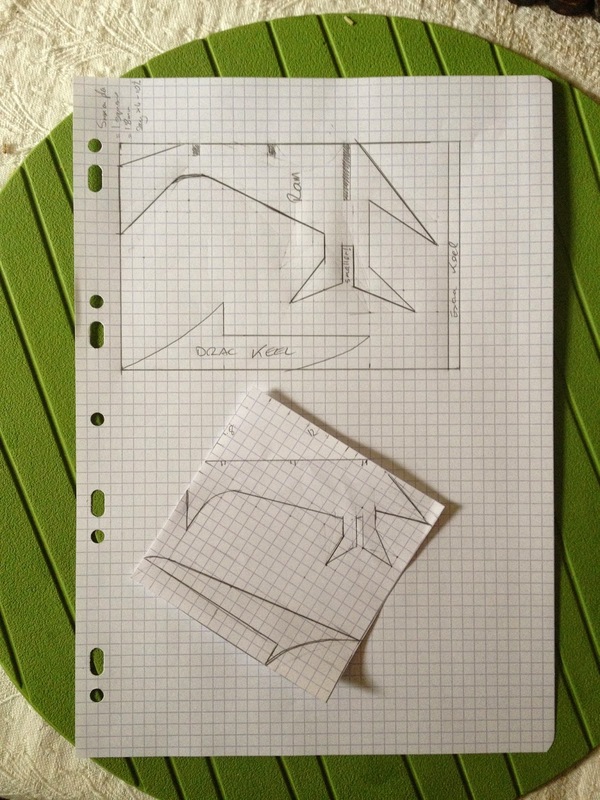 For the second attempt the plan on the 10cm x 15cm scale and went much faster. Now the ram/prow is tall enough to give some headroom to crew on the deck should they fly just beneath another vessel - the prow might hit the other vessel but at least the crew won't be scraped off the deck! 2) Flying stand. Only time will tell how sturdy this is, but it's working so far. I had to dismantle some of the decks and start again, firstly cutting holes to take the rods - or at least the housings for them. I also cut out a 1cm notch on the bow to take the ram. I bought four 20mm x 6mm barrel nuts that will take a 5mm rod with an OK amount of clearance. I capped two of them off with a small piece of MDF to build the length nearer the 30mm thickness of the polystyrene. These were then inserted into holes drilled/excavated in the underside of the ship by partly-filling the excavated hole with filler, and pressing the nut into this. Once dry these are nicely seated, and I built the assembly up to be flush with the polystyrene by adding some holed balsa wood which will also glue nicely to the deck when glued back on. For the base, I cut out two pieces of MDF* and drilled out two holes for the screws that would hold the barrel nuts - larger on the lower level so that the retaining screw would countersink nicely. I also drilled and filed holes through the ram and keel to align with the interior barrel nuts. Next, I cut some 5mm hardwood dowel to size (longer for the bow than for the stern) and inserted it dry so that I can dismount the model if I need to. It is a little wobbly, so I may replace the wooden dowel with mild steel ones - 5mm should be easy to find if I need it, but at least I can drill/file out a broken wooden dowel at need. Total material cost so far is about €3 for the various bits of balsa wood, €2 for the nuts and screws, €1 for enough dowel for the flying stand plus about €1 for enough mdf for the base. The polystyrene was offcuts from what I used to make hills - not exactly free but difficult to quantify. I still have to add in the costs of the balustrade and propellors, but if I can keep the overall material costs under €20 I think that's a decent result. OK, I live in a particularly expensive part of Europe, and the guns and crew will be extra, but please play nice. * This was before learning of the health horrors of MDF dust. The next time I cut, file or sand MDF it will be outdoors with a mask on! That is excellent work sir! It's ... progress, yes, but thanks. Genius? I merely dream of clambering onto the shoulders of giants! Thanks for the very kind comment. You say this is a pre written post have you progressed much further since this? Oh, now wouldn't that be telling! Short answer - yes, but I want to get more of the panelling done before taking more piccies and publishing.